Four days after the last update, Apple has made available the sixth beta for iOS 11.3 for developer testing. Apple pre-announced the main features included in iOS 11.3, with the features including Health Records and new additions to the Animoji roster. Subsequent betas introduced Apple's battery health feature, which warns users if the iPhone is throttled, in the event the battery is considered too worn to support the maximum power draw continuously. While earlier betas included support for AirPlay 2, the fourth beta released on February 20 removed the functionality. 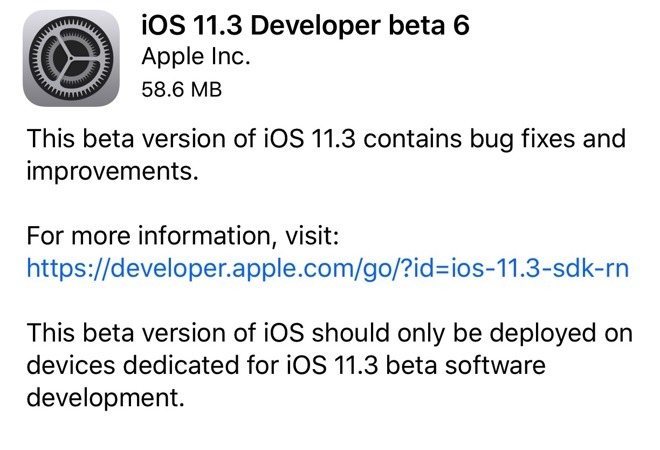 The sixth iOS 11.3 beta has build number 15E5216a, while the fifth beta release had build 15E211a. The relatively small increment, and short period of time between iterations implies that release is soon —likely at Apple's education-centric event coming on March 27. Apple's macOS High Sierra 10.13.4 and tvOS 11.3 were updated on Monday.